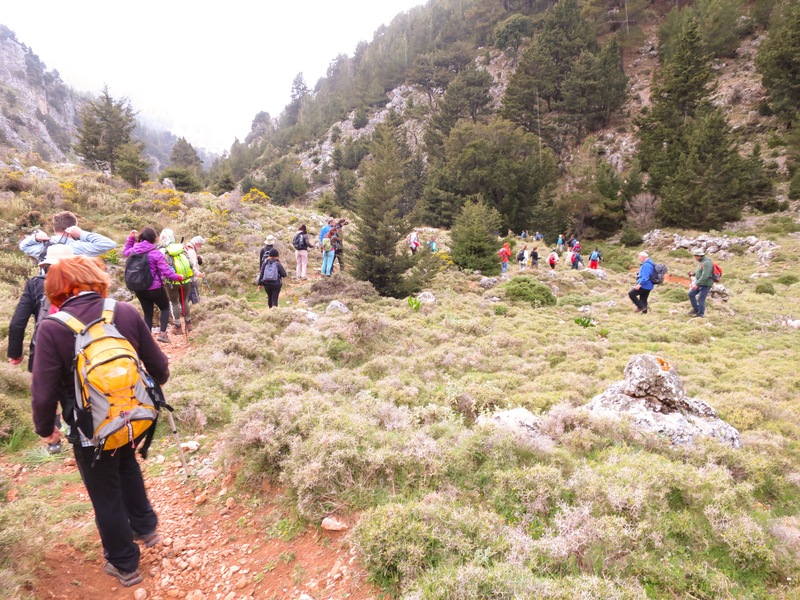 I wonder why it was that I kept playing this ditty over and over again in my head as we set off on our mountain trek with the Chania Mountain Climbing Club? In the mountains , its considered a sport to ‘shoot up’ ‘ the road signs…..
A few days earlier, over a rather long lunch at one of our favourite restaurants, Cuisina EPE in Splanzia district of Chania, a friend of ours from Madrid happened to mention that she had gone on a trek with this local climbing club, and really enjoyed it. She mentioned that they also had advised her about an easy trek happening on the next Sunday, and although she would be back in Spain by then, urged us to look it up on the ‘net’, which of course I did. 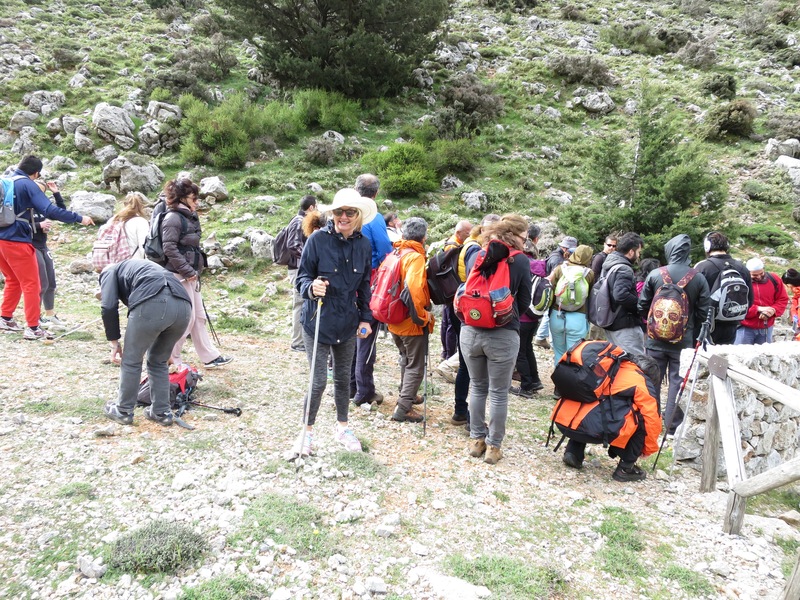 The website of the ‘Greek Mountaineering Club of Hania’ to give it its full title, wrote that on Sunday 10th of April, there was a ‘meet’ which was going to, and I quote…. 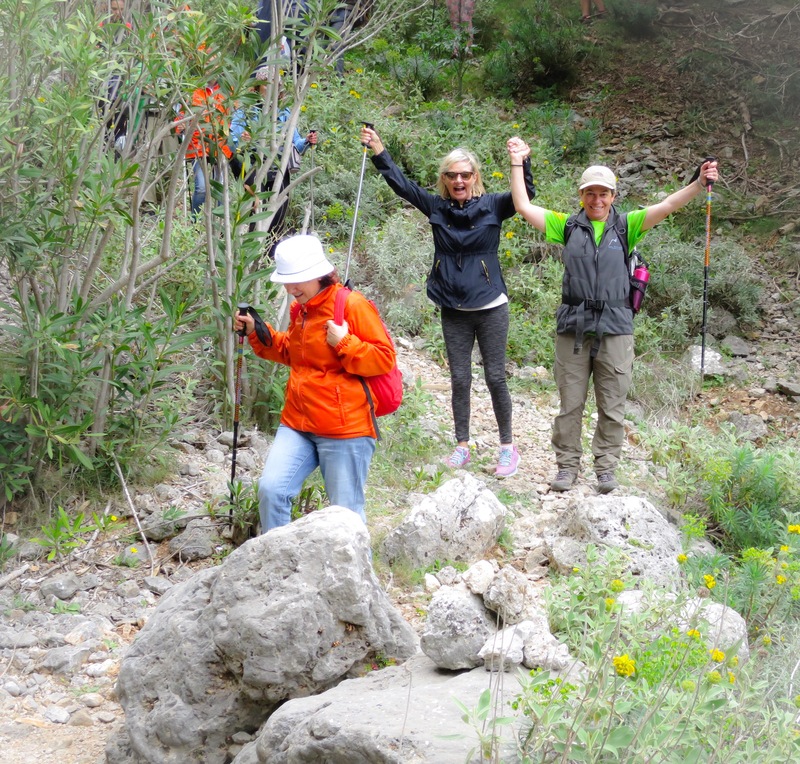 It is an easy walking activity in the path E4, in Selino’s province, that leads to Agia’s Irini village. 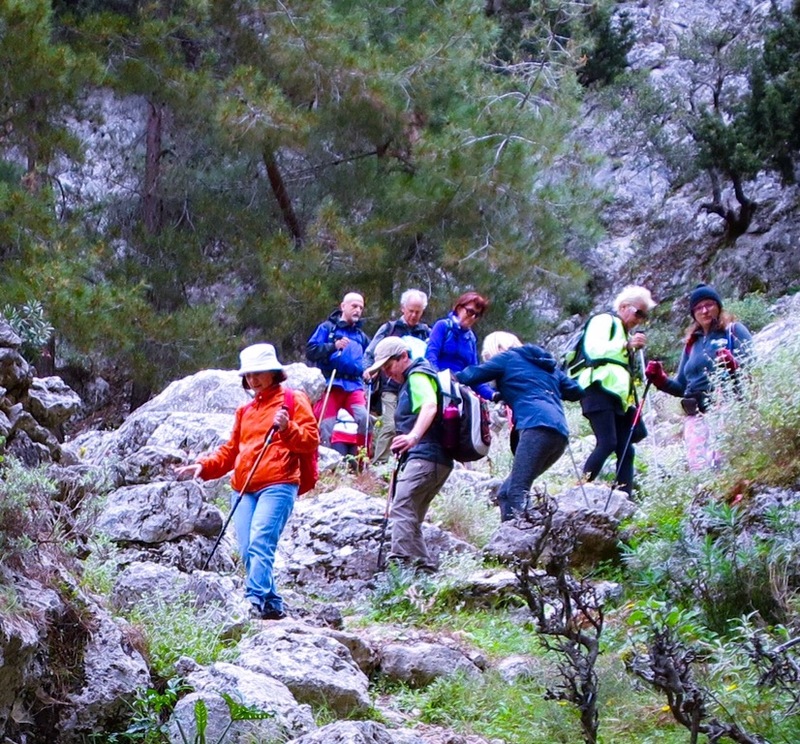 In the noon we will walk up to Omalos through the path called Vasiliki strata. Participants must have good physical condition and have their windproof, hat, junk food and water. Hiking shoes required! THE PRICE IS 15 EURO PER PERSON AND WE WILL BE BACK IN CHANIA 6 TO 7 O’CLOCK IN THE AFTERNOON, SO ARE YOU STILL INTERESTED TO COME? Also if you want to ask any other information, you should contact the Association’s offices at 28210 44647, which is open every evening from 21: 00 to 23: 00, except for Saturday and Sunday. Well I don’t have a ‘windproof’, but I figure it’s springtime here now, it’s warm and sunny, and junk food and water no problem. Hiking shoes though, that’s something I didn’t think to bring with me, I wonder if my old pair of comfortable ‘crocs’ will do. Probably not, so late on Saturday afternoon I go out shopping to look for a suitable pair of ‘Hikers’. Most of the shops in Crete, unlike in Oz, still keep to the old fashioned and sensible shopping hours, which means early closing on a Saturday, and closed on a Sunday ( Does my bias as a former OZ shopkeeper show here). However, I did find one small shop in the old town that was still open, and they had just the thing for me, a really comfortable and dare I say, cool looking, pair of hiking shoes for only 20 euros! 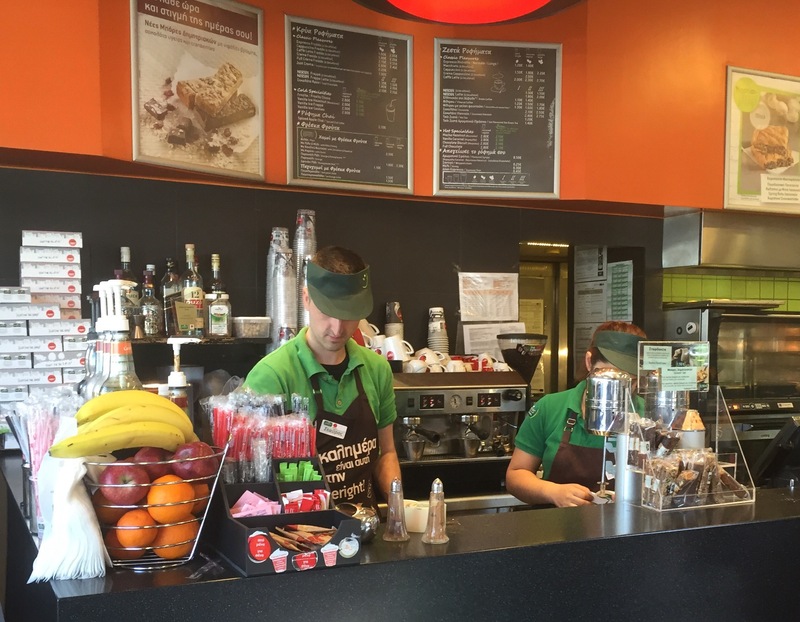 I ask the young lady serving me, and in Greek, where they are made. ‘ Germania’ she replied. “Germania ?” For twenty euros you’d be lucky to buy a pair of shoelaces from Germany, but I don’t tell her this naturally. “Not China’? I ask again….. “Oxi, (No) Germania!” ….and she shows me a small label stuck to the lining of the shoe which does actually say Germania. Mmmm, so maybe only the label is made in Germania, but why argue, I need a pair of hiking shoes for tomorrow, it’s Saturday afternoon, this seems to be the only shop open, they are the only hiking shoe they have in the store ( but do have it in two different colours) and what’s more, they are only twenty euro…. Oh yes, and they fit like a glove….. (like a shoe would be preferable)! Yineka mou is not too worried about her lack of suitable footwear however. She tells me that she has been in the shoe business ( is that a bit like show business, but with fancier footwork?) for 40 years, and her pair of ‘Sketchers’ will do nicely, and ” I hate those ugly walking/hiking thingies, no way am I going to be seen in them” OK, no worries then. Very early night at home tonight, no ‘out on the town’ antics for us this evening, as we have to be up early to catch the coach which leaves from outside the Mountaineering Club at 8am sharp. Set the alarm on my iPad and also iphone for 6:30, don’t want to wake up late for this excursion. 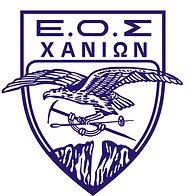 We leave our house in the Old Town at about 7:15 and hurry along in the direction of where the coach leaves from, stopping on the way at Gregoris Cafe to pick up a coffee each ( best takeaway coffee in Crete) and some junk-food, as advised by the club. Our junk-food consists of a ham and cheese wrap each, a spanakopita ( spinach pie) and a doughnut…. plus we have a couple of oranges, some cough lollies and of course a bottle of water each, so not that ‘junkie’. 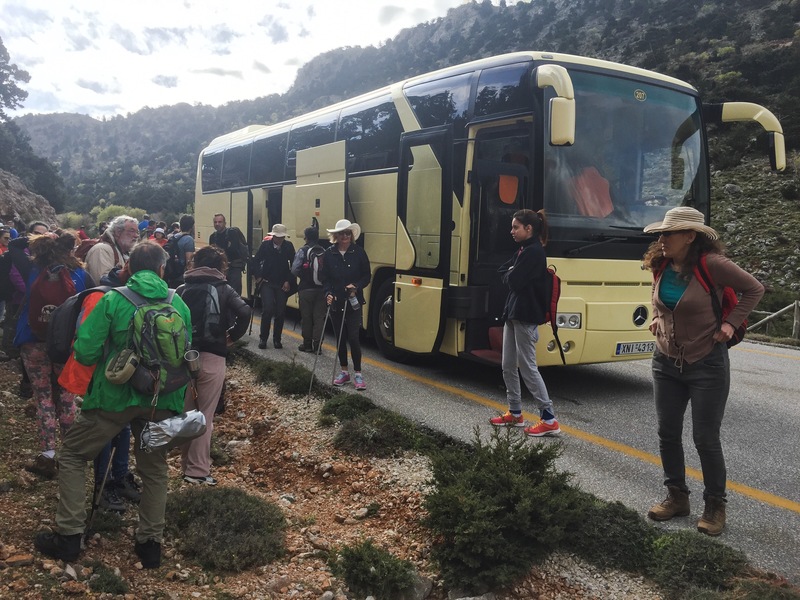 We arrive outside the HQ of the Mountaineering Club in Tzanakaki Street 10 minutes early, at 10 to 8, in order to find a good seat on the coach, and we see that the coach is already there waiting, along with a smaller maxi-van. There are a good few people milling about near the coach, smoking, eating, talking, smoking, etc, though none is yet bothered to get onboard. I’m pleasantly surprised to find that it seems to be only local Greek people have turned up, not the foreign tourists that I’d expected. At about 8:15, someone shouts out something in Greek, and the people waiting move towards the coach to board, as do we. YM loves to sit in the front seat and somehow manages to push her way to be first on the bus, but is very disappointed to find she has been ‘gazumped’. A couple of crafty Greeks have already left their belongings on the front seats, so she has to be content with a seat a couple of rows back. At 8:25, we still haven’t left, as their are not enough seats on the two buses to take everybody….. more people have turned up than have bothered to make a booking. After a lot of shouting, gesticulating, head scratching etc, the smaller bus takes off back to the depot, in order to be replaced, hopefully, by a larger coach. Immediately this has been explained to us all, everyone on our coach decides to disembark back onto the street for a final smoke, a wee, or just to stretch out. At around 8:45 the new replacement coach arrives, all the waiting passengers hop onboard their respective coaches as quick as a flash, and within a few seconds we are off, like a dirty shirt! 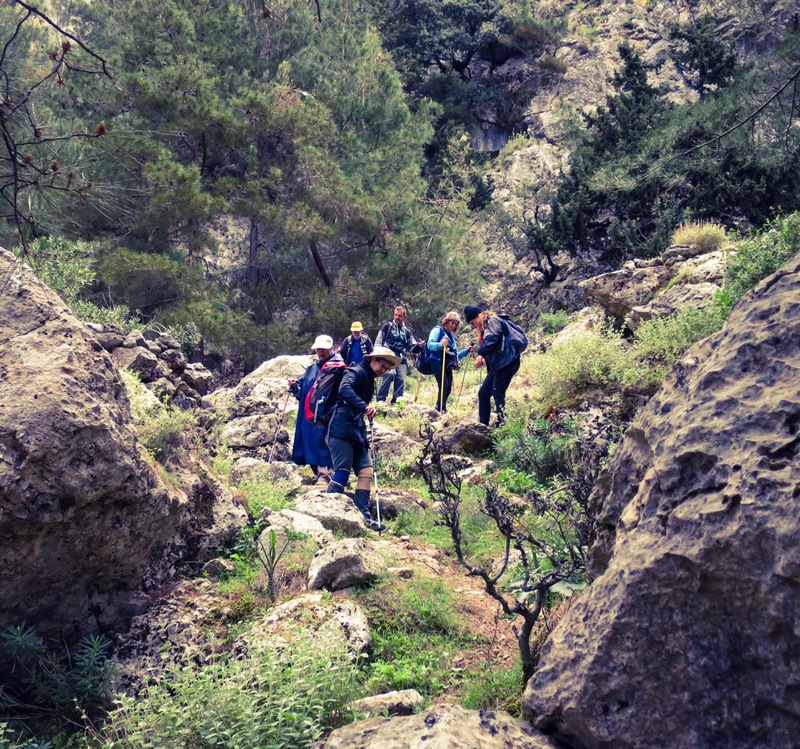 On the trip up the mountain to Omolos, our group leader, Alexandros, takes the microphone and explains in detail exactly where we will be hiking, what we’ll see, what time and where we need to meet up at the end of the day….. and he talks very very fast, in Greek! Now, while I can speak Greek quite well, and can read and write in the language, it’s a different matter trying to listen to a guy who is talking ten to the dozen and interpret what he’s saying. Luckily for me, a lady sitting opposite, knowing that I was a foreigner,…. a Xenos…. asks me how much of Alexandros’s talk had I understood. ” oh, about 25 percent” I lied, ” maybe less”. “Mmmm endaxi (OK)” she said, and then filled me in on the most important aspects I needed to know. We reach our starting point about an hour later, way up on the mountains, just outside of the small village of Omolos. Disembarking from the bus, I Immediately realise that I have not come fully prepared, as I seem to be the only one among the seventy odd people who is wearing shorts…. and a tee-shirt. Back in Chania, I thought it quite odd that all the others were decked out in long pants, sweaters, hoodies, windproof jackets etc, I mean it was quite warm, even that early in the morning. But up here on the mountain it was bloody cold, and windy. Oh well, I did have a sleeveless lightweight cotton ‘Jerkin’ and a cotton scarf with me, and with all the walking we’d be doing I’d soon get warm wouldn’t I? 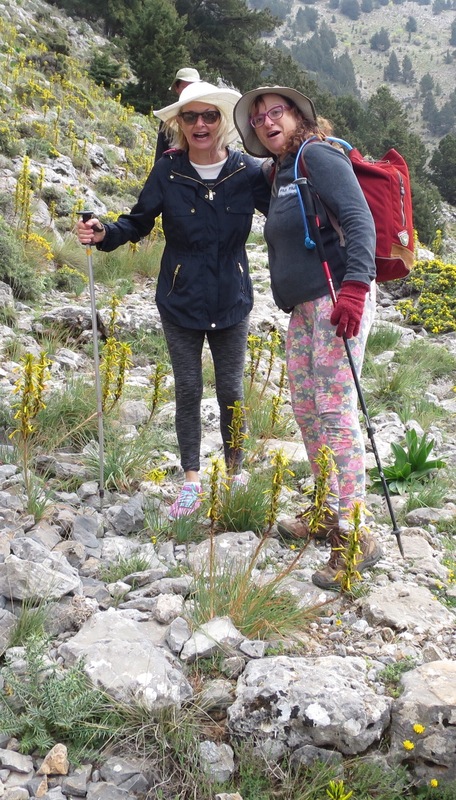 YM was a bit more prepared than me, she did have on leggings and a windproof ( something that would have been handy while having dinner in Milia last week?) although in the shoe department I can’t say I was very impressed with her Sketchers ‘Go-Walk’s’. We were both given a ‘walking pole’ to use, by one of the mountaineers, who told us we’d probably find it will come in handy….. Quite an understatement as it turns out. Fully equipped, we set off at a quite a brisk pace, with YM and I keeping up with those at the front of the pack…..for the first ten to fifteen minutes it was easy-peazy, all downhill, and the trail was relatively smooth going. It soon became apparent though, as the ground became rockier, the trail became narrower and the descent steeper, that someone who suffers from vertigo should probably not be attempting this hike. I’m not talking about myself here, but YM, as walker after walker overtook us and our progress became slower. Slower, did I say slower…. No, by now we had actually stopped walking. YM was frozen with fear, and wanted to go back, though back to where I don’t know, as our coach had long since departed. Pretty soon we found ourselves at the back of the pack, where we were met by Maria, who announced to us that she was one of the ‘Sweepers’…..sweeping up the remnants of the group, making sure that everyone was ok, and not lost or scared. YM wasn’t lost or scared, she was terrified, and fearful of falling off the edge of the trail and plunging at least 1000 metres, give or take a few metres, down to the bottom of the gorge. Maria, an ‘Angel in Disguise’ told YM not to worry, I’ll help you, and she gave her another walking pole to use, as “four legs are better than three” and arm in arm they began a very slow descent together. Maria assured YM that the trail would soon begin to get easier. “Soon” she lied, because it sure as hell didn’t seem to be getting any easier. 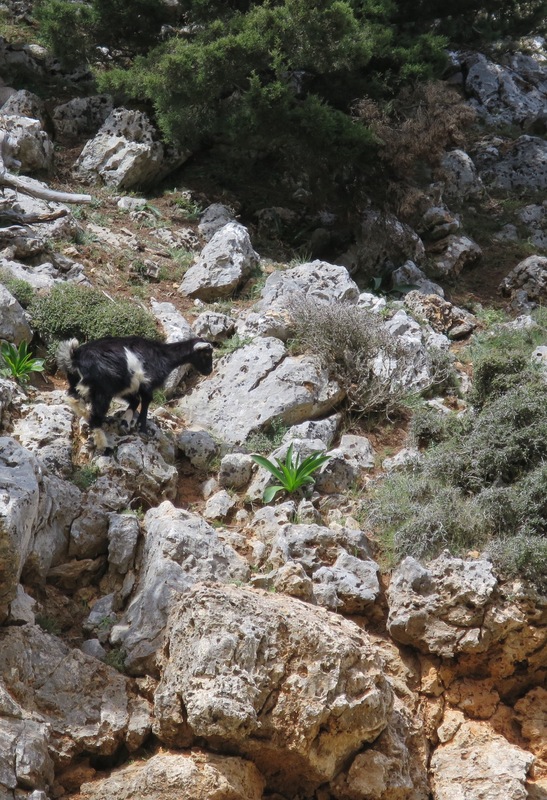 At one stage the trail disappeared completely, a bit of a landslide had recently occurred, and we all took to edging our way, single file, along the gravelly edge of the side of the cliff. Both Maria and I reassured YM that she was doing well…. “Just don’t look down and you’ll be fine” was our constant refrain. The going is really very slow, you need to keep your eyes firmly fixed on each step where you are putting your feet, and dare not look down, nor for that matter look up nor even sideways. I’ll bet the scenery is fantastic up here, but I daren’t look. I now know why, on these hikes in Crete, that they never tell you how far the distance is that you have to travel to reach your destination, but rather how long it will take reach there. We’ve been going for well over an hour I guess, when we reach the first of our resting places, a plateau half way down the side of the mountain, not far from where the top of the gorge begins. After a brief stop, long enough to peel and eat one of the oranges, we set off again on what is a pleasant walk towards the gorge proper. YM is very happy now, as the going is pretty easy, but less than five minutes later we reach the beginning of the gorge. But of course we aren’t at the bottom of the gorge, but on the steep sides a couple of hundred feet above, and once again YM succumbs to a bout of Acrophobia. Fair enough I suppose, especially here on Crete, as it’s yet another word that the Greeks invented . ( ákron , meaning “peak, summit, edge” and phóbos, meaning”fear”) In other words, an irrational fear or phobia of heights, especially when one is not particularly high up. “Look” I say firmly ” it’s only one foot after the other, how difficult is that?” Her short reply was not at all ladylike. Luckily enough, one of the three ladies who were following behind us on the narrow trail, offered to assist YM over the difficult bits. 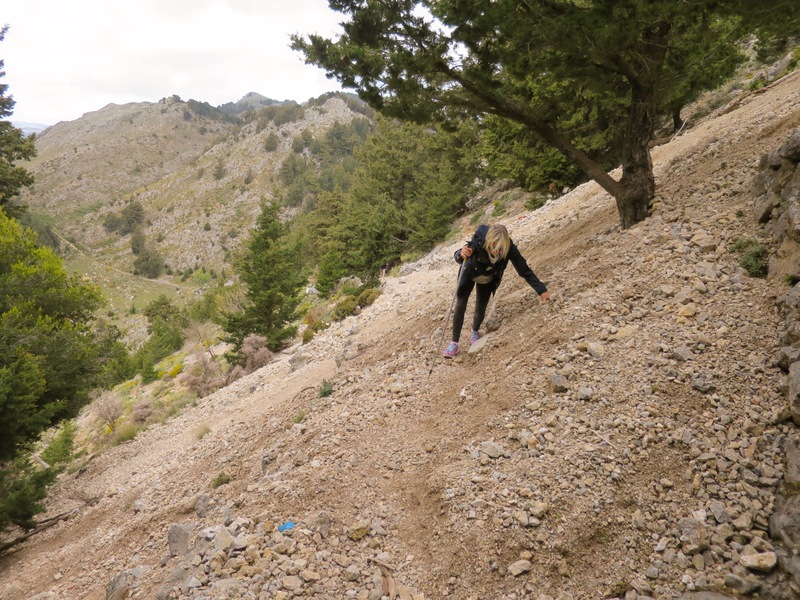 She told us she was an orthopaedic nurse in Chania, and said that it would be easier for her if she spent half an hour helping YM down into the bottom of the gorge today, rather than have to spend all day Monday fixing up her possible broken ankle! This part of the trip, through the thickly wooded sides of the gorge was very scenic, and soon enough we reached the bottom and made it safely to our next resting place…… Time to break open that Junk Food. 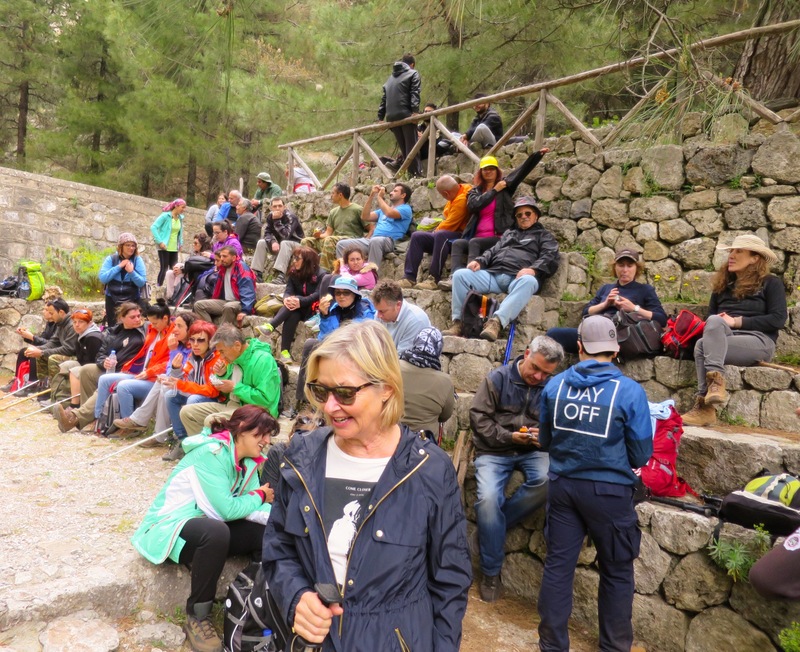 I was surprised to see that many of the walkers also took this opportunity to get stuck into the Ouzo that they had brought along. Unfortunately, I had to decline their offer of a drop myself….I’ll need my wits about me for the climb back up the mountain. 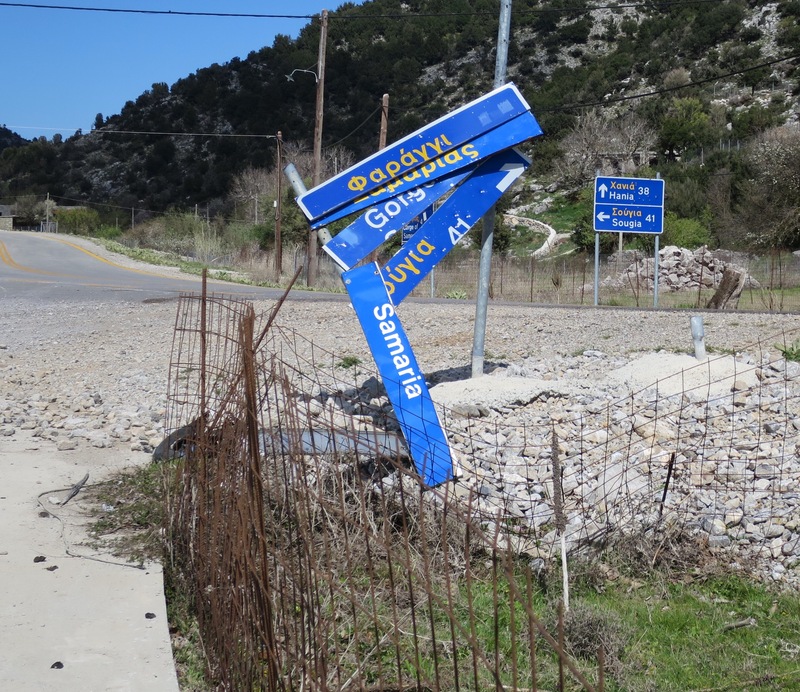 Alexandros, our tour leader, told everyone that if they wanted to get the bus back up to the village of Omolos, instead of walking back, it would be leaving shortly. A few of the walkers took up the offer, and have to admit I gave it more than a second thought, but decided that I’d not wimp out, and would take the challenge of walking back up, although by a different route. YM put her hand up to get the bus back, but was soon talked out of it by the ladies who’d helped her down the mountain. They told her that she would find it it much easier to walk up than it was coming down. …….. And they were right, while it was pretty tiring, it was a lot easier. 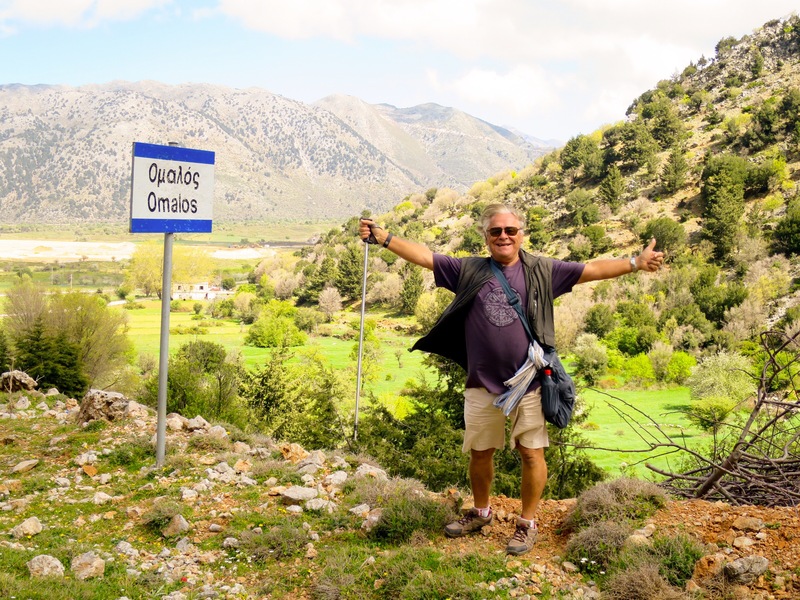 By the time we reached the village of Omalos, it was about 4pm, and everyone in the group ended up at one of the taverna’s in the village for a very welcome drink or two, and a snack, before the buses took us back to Chania. 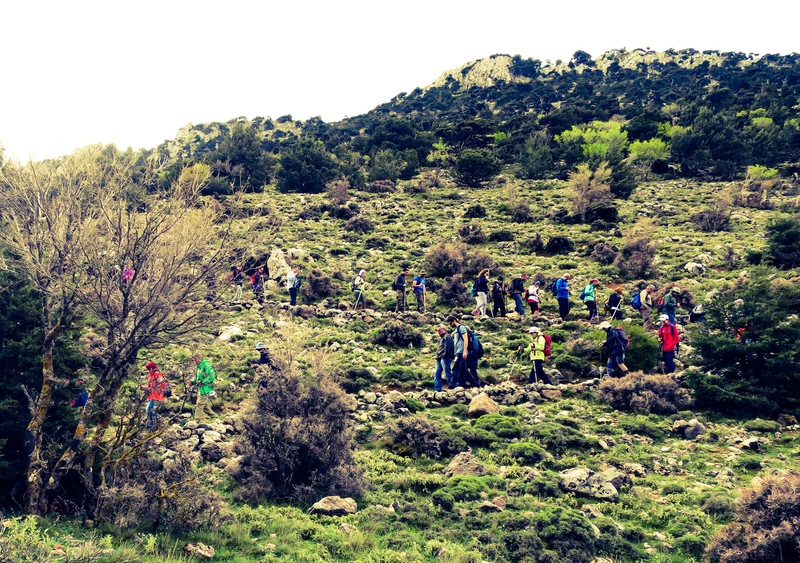 Thanks Chania Mountaineering Club, it was a great day, shared with very friendly and very helpful people……. and I promise that next time we’ll come better prepared! no problem for this guy…..